It has been two weeks since the wedding – a crazy, unusual, exciting two weeks of house hunting filled with things I’ve never had to think about before, like standard variable mortgage rates, and freehold vs leasehold, and why combi boilers are better than condensing ones. But that’s a whole other story – for another day’s rationalisation of why we’ve settled on a flat with a kitchen that has no oven and hasn’t been updated since the 1960s. I’ve only just about managed to get the stickiness off my revolting rented linoleum kitchen floor. In the franticness that led up to the completion of the cake all manner of meringue, cake mixture, sugar, eggs and frosting ended up splattered and trampled into the floor. Was the wedding cake a success? I grimace at the question – I was not entirely happy with it. Or should I rephrase and say that it just didn’t look exactly how I imagined it would. 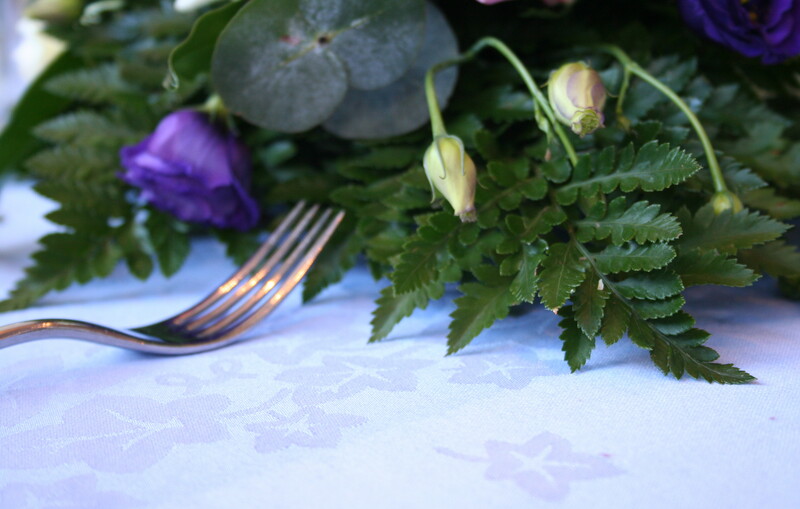 Some of it was out of my control – the avalanche roses and blooming blue irises that were meant to wedge the two tiers together in a statement of floral opulence were left out of water overnight by the florist. And so when I got them, the few I could use were so wilted they couldn’t hold their shape, let alone fill the gap between the two tiers. 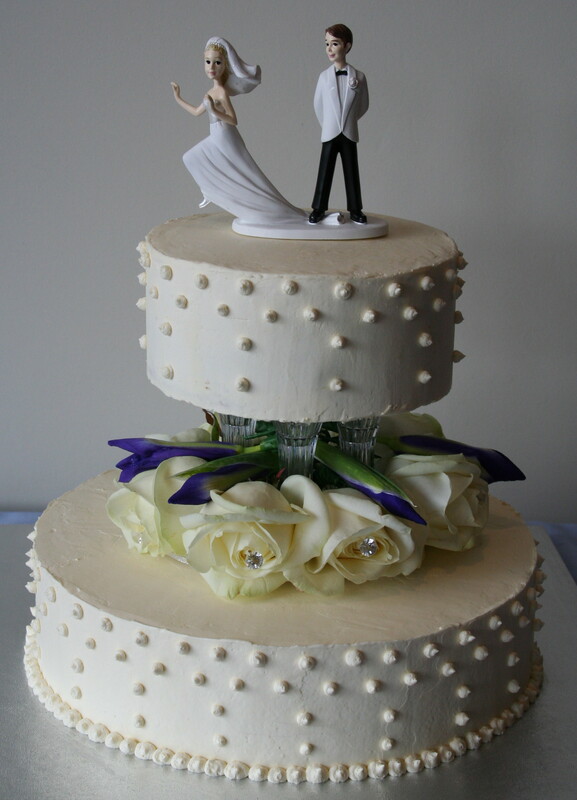 This also meant that the tiny imperfections at the bottom of the top tier were very visible. I had hoped they would be hidden behind big curling petals, but alas. And the inside? It was delicious. 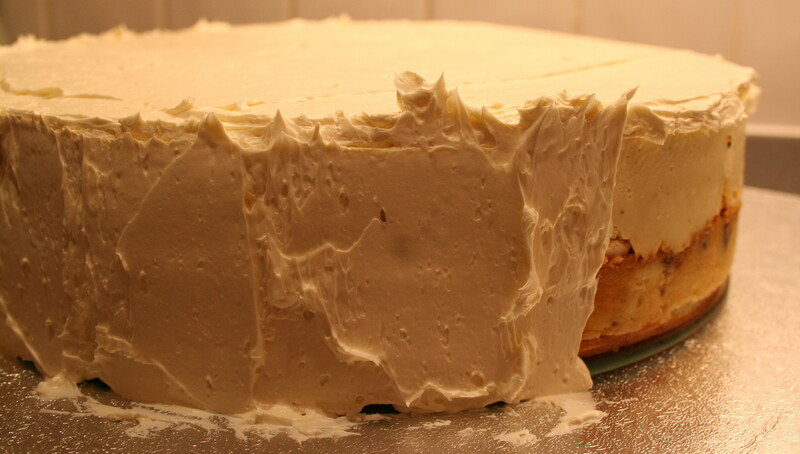 But not exactly how I wanted it – I think I over beat the genoese sponge and it was thicker than I wanted. So, for a bride who did not want a sponge cake, I think there was slightly more sponge than she wanted. It was however not as sweet and rich as it should have been considering how much sugar and butter and eggs went into. And there was none left over. Using these quantities, I made three genoese sponges and froze them. This gave two layers of sponge for both tiers. For this layer I adapted the recipe for chocolate brownie & raspberry cheesecake by taking out the hazelnuts, raspberries and chocolate – and baking it without a base. These quantities are enough for a 9 inch cake tin. I doubled it for my two tiered wedding cake (one 10 inches and the other 6 inches). 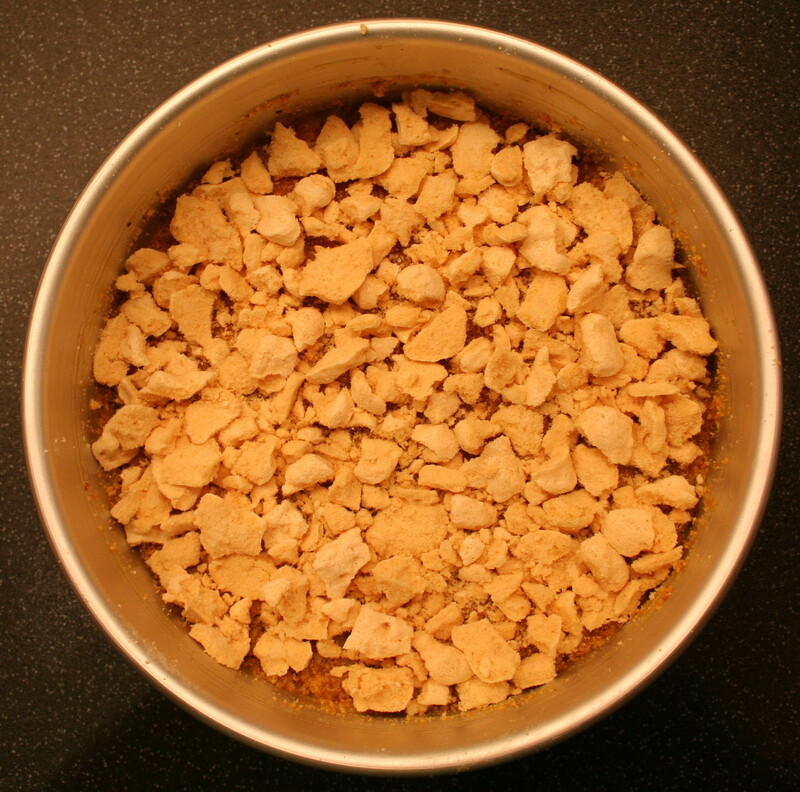 Although I did not bake this cake with a biscuit base as I was using it as a layer inside a cake, you can easily do this if you want to make the cheesecake on its own by crushing digestive biscuits and mixing them with a little melted butter and pressing it into the base of the cake tin before layering the cheesecake mixture on top. Or you can use the brownie biscuit base I used in the original recipe. Preheat the oven to 160°C (140°C in a fan oven). Using an electric mixer whisk the soft cream cheese and 75g of the castor sugar. Add the egg yolks one at time until thoroughly combined. Whisk in the crème fraiche. In a separate bowl with clean beaters whisk the egg whites until stiff. Add the vanilla extract. Gradually whisk in the remaining 100g castor sugar until the mixture is stiff and glossy. Add the meringue mixture to the cream cheese mixture and mix thoroughly. This can be done fairly vigorously – don’t worry about knocking the air out of it. Pour the mixture into the buttered springform tin and bake in a for 60 minutes. Allow to cool completely in the tin before removing. Hazelnut praline can be made days in advance and kept in the fridge for a few weeks. For the wedding cake I made a quantity using 100g nuts from this recipe – and still had some leftover. Meringue can be used for so many different recipes. For the wedding cake I made a batch from the basic meringue recipe and piped them onto a tray before baking them. This recipe comes from a cake in Pierre Hermé’s new book. 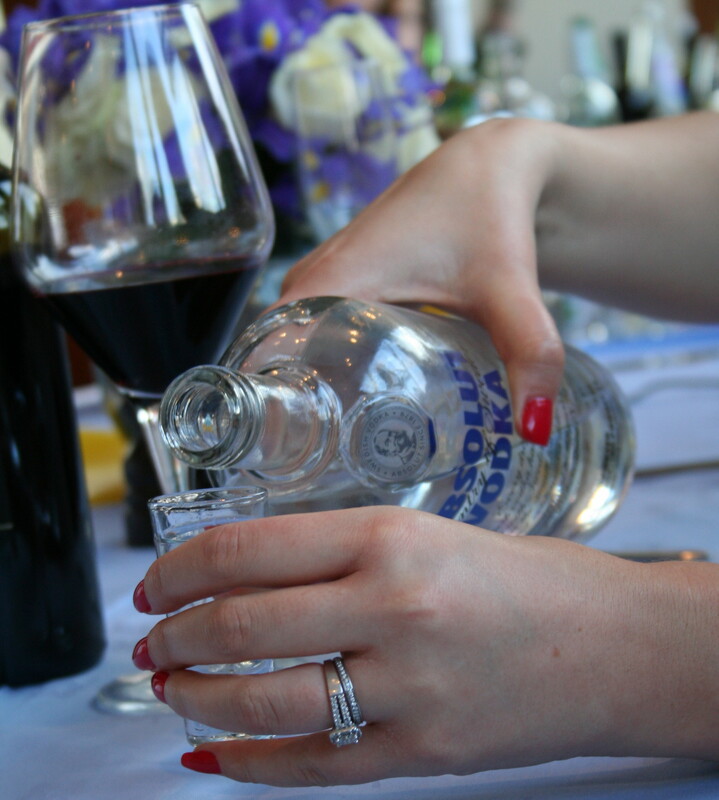 The below quantity is enough for a layer in a 9 inch cake – I doubled it for the wedding cake. Soak the gelatine sheets in cold water for 20 minutes. Whip the double cream until stiff peaks just start to form and set aside. In a saucepan boil the water and sugar to a temperature of 121°C. Put the egg yolk in a bowl. Pour the boiling syrup over the egg yolks whisking at high speed with a hand held immersion blender (I found this difficult to do with such small quantities and so used a hand held mixer instead of blender – be sure to whisk fast so as not to cook the egg). Reduce the speed to medium to cool the mixture. Place a bowl over a pot of simmering water and melt the cream cheese and pistachio paste. Add the icing/confectioners sugar, the drained and squeezed out gelatine sheets and the beaten egg yolk mixture and stir until combined. Fold in the whipped cream. 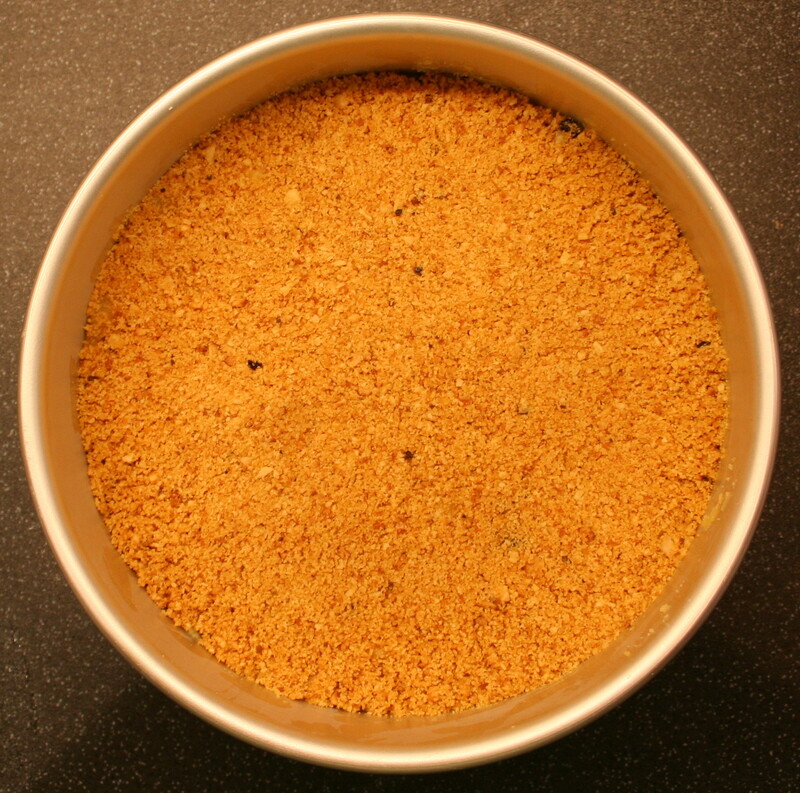 Pour the mixture onto the desired cake, freeze for 3 hours and then transfer into a fridge. Although I’m not a fan of butter based frosting – this one works incredibly well for me. It’s easy to work with, and not too rich or sweet. It also holds well and lasts well – provided it doesn’t get too warm! I made one and a half times this recipe for the two tiered cake. This recipe is for a two tiered cake. Using either springform or loose bottomed cake tins, place a round layer of pre-made genoese sponge in the bottom of a 6 inch and 10 inch cake tin. Place a pre-made layer of pistachio cheesecake on top of the genoese sponge. 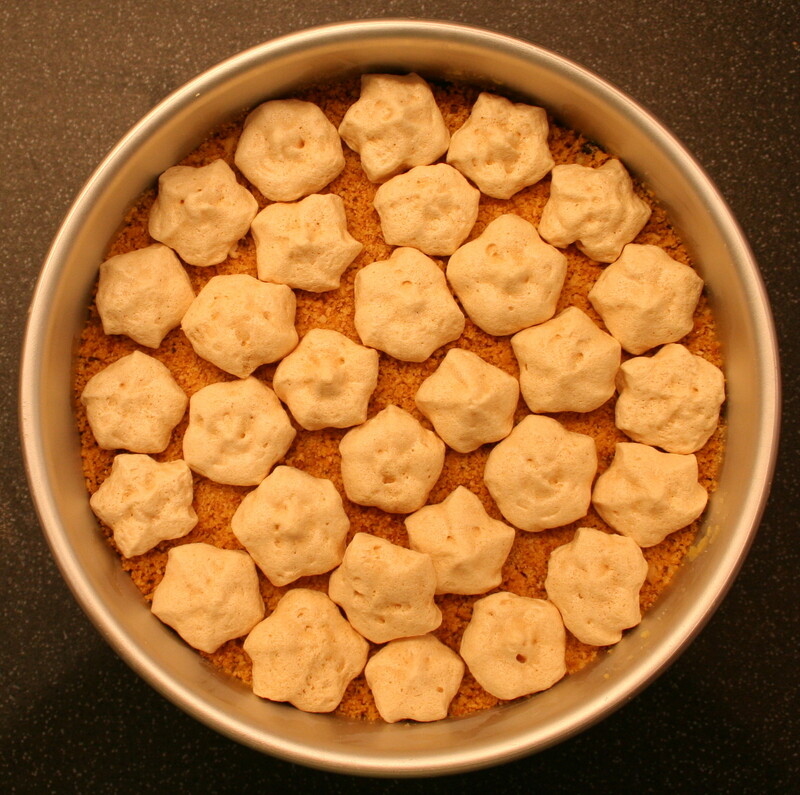 Cover the cheesecake with a 5mm layer of hazelnut praline. Either layer or crumble the meringue over the praline. 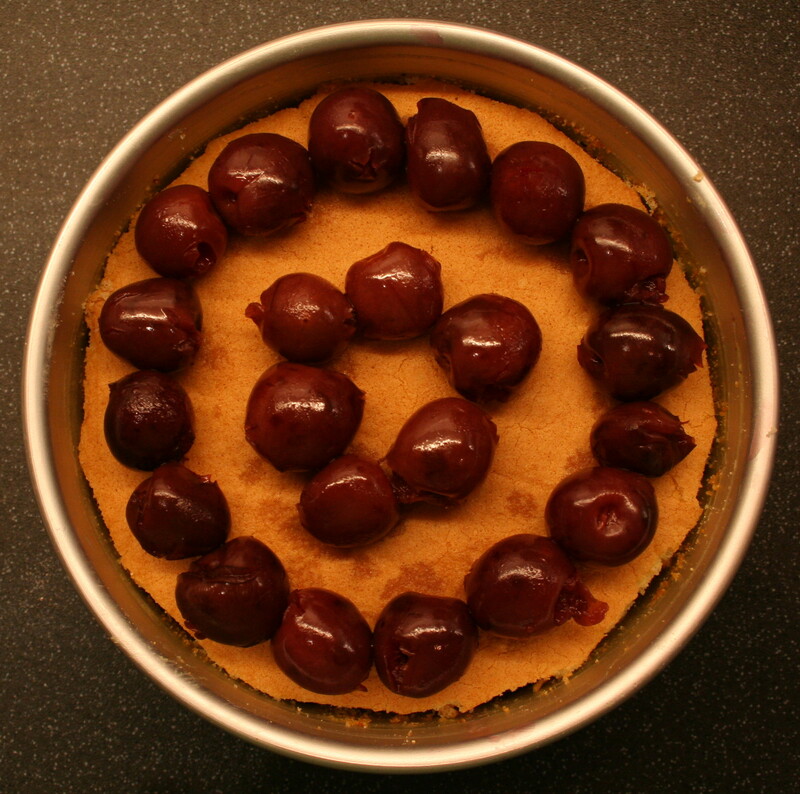 Place another layer of genoese sponge onto of the meringue and cover it with a layer of cherries. 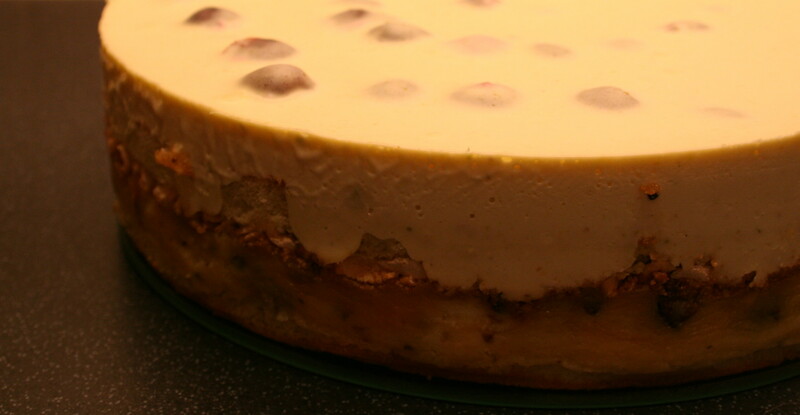 Pour the pistachio mousse carefully over the cherries and place the cake in a freezer for 3 hours. Transfer to the fridge and allow to set overnight. To remove from the cake tins, blow a hot hairdryer around the sides of the cake tin for a few minutes to slightly melt and loosen the mousse. Frost the cakes with the swiss meringue buttercream. To assemble them pushed 4 wooden dowel sticks (the height of the bottom tier) into the middle of the bottom layer and placed a 6 inch cake board on top of it. I then placed 4 cake pillars on top of this and balanced the top tier, still on its cake base, on them. Before the top tier was placed on the pillars, the flowers were arranged around the pillars. This entry was posted on Sunday, April 29th, 2012 at 18:27	and tagged with cherries, genoese sponge, hazelnut praline, meringue, nuts, pistachio cheesecake, pistachio mousse, pistachio paste, swiss meringue buttercream, wedding cake and posted in cake, celebration baking, frosting. You can follow any responses to this entry through the RSS 2.0 feed.